Here's a cute set of Christmas tree ornaments form Hallmark. I love how this set includes four of our favorite Star Wars character including C3PO, Darth Vader, Storm Trooper and R2D2, that they're dressed up a bit to resemble Christmas icons like Santa Claus, an elf, Rudolph the Red-Nosed Reindeer and that they are boxed for Christmas gift giving. They would suit any Star Wars geek either given as a set, given individually or given as a stocking stuffer. 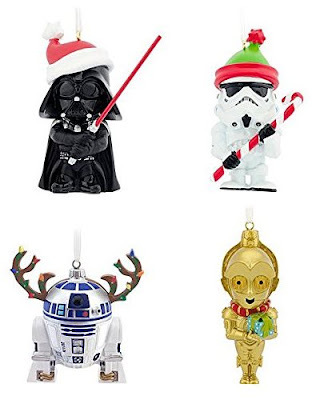 Find these Star Wars Hallmark Christmas ornaments on Amazon.